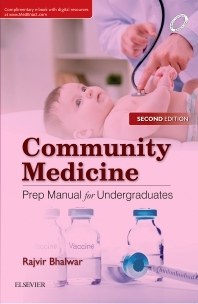 This book fulfills the unmet need of quick review question answer book and at the same time cover the entire syllabus of Community Medicine, spread over 30 chapters and each chapter has 1 or 2 solved long questions, 8 to 10 solved short notes, viva voce and MCQs related to that chapter. Recognised Post Graduate and Post Doctoral teacher and guide as well as examiner for MBBS, M.D. and Ph.D. for Pune University, Maharashtra University of Health sciences, & Rajiv Gandhi University of Health sciences. Professor & Head of Dept of Community Medicine at Armed Forces Medical College, Pune and Army College of Medical Sciences Delhi. Govt. Of India expert for Union Public Service Commission and expert member of National Disaster Management Authority. Dr Rajvir Bhalwar has a total of 72 published articles / research papers in reputed national and international journals, as Principal Author / Co-author. Below are some of the books written or edited by him.